Kuusamo is a town and municipality in Finland. Visiting Kiutakongas Rapids and Safaris will get you outdoors. Step out of Kuusamo with an excursion to Pieni Karhunkierros Trail in Juuma--about 38 minutes away. There's lots more to do: fly down the slopes at Ruka, get outside with Karhunkierros, stop by Shopping Center Kumpare, and identify plant and animal life at The Predator Center in Kuusamo. To find traveler tips, photos, maps, and other tourist information, you can read our Kuusamo journey planner. Mexico City, Mexico to Kuusamo is an approximately 24-hour flight. The time zone changes from Central Standard Time to Eastern European Time, which is usually an 8 hour difference. Expect much colder temperatures when traveling from Mexico City in March; daily highs in Kuusamo reach -2°C and lows reach -13°C. Cap off your sightseeing on the 27th (Wed) early enough to catcht the bus to Oulu. Oulu is a city and municipality of inhabitants in the region of Northern Ostrobothnia, Finland. 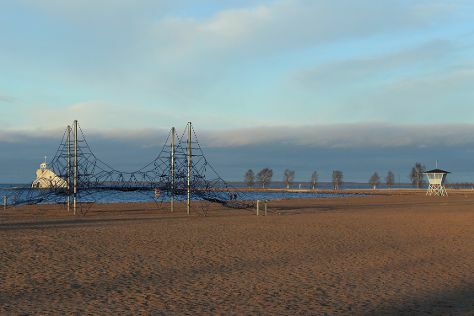 Step out of the city life by going to Nallikari Beach and Koitelinkoski. And it doesn't end there: look for all kinds of wild species at Hupisaaret Park, see the interesting displays at Oulun Automuseo, pause for some photo ops at Toripolliisi, and contemplate in the serene atmosphere at Oulu Cathedral. To see reviews, photos, where to stay, and more tourist information, read Oulu day trip planning site . You can take a bus from Kuusamo to Oulu in 3 hours. Other options are to drive; or fly. Traveling from Kuusamo in March, plan for somewhat warmer nights in Oulu, with lows around -8°C. Wrap up your sightseeing on the 30th (Sat) to allow time to travel back home.